Common Git Commands – Learn how to use Git. Working with Git on the command line can be daunting. 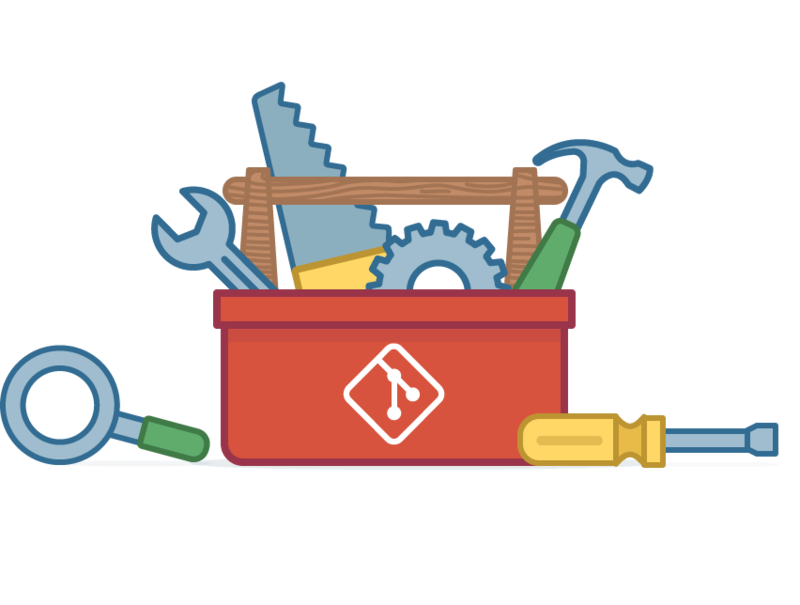 To help with that, we’ve put together a list of common Git commands, what each one means, and how to use them. Our hope is that this makes Git easier to use on a daily basis. Git has many great clients that allow you to use Git without the command line. Knowing what actions the client is performing in the background is beneficial to understanding how Git works. If you’re getting started with Git also check out our fantastic guide on the topic. This command turns a directory into an empty Git repository. This is the first step in creating a repository. After running git init, adding and committing files/directories is possible. Adds files in the to the staging area for Git. Before a file is available to commit to a repository, the file needs to be added to the Git index (staging area). There are a few different ways to use git add, by adding entire directories, specific files, or all unstaged files. Record the changes made to the files to a local repository. For easy reference, each commit has a unique ID. It’s best practice to include a message with each commit explaining the changes made in a commit. Adding a commit message helps to find a particular change or understanding the changes. $ git commit -m "Commit message in quotes"
$ git commit -m "My first commit message"
This command returns the current state of the repository. git status will return the current working branch. If a file is in the staging area, but not committed, it shows with git status. Or, if there are no changes it’ll return nothing to commit, working directory clean. Your branch is up-to-date with 'origin/SecretTesting'. With Git, there are many configurations and settings possible. git config is how to assign these settings. Two important settings are user user.name and user.email. These values set what email address and name commits will be from on a local computer. With git config, a --global flag is used to write the settings to all repositories on a computer. Without a --global flag settings will only apply to the current repository that you are currently in. There are many other variables available to edit in git config. From editing color outputs to changing the behavior of git status. Learn about git config settings in the official Git documentation. $ git config --global user.email "my@emailaddress.com"
$ git config --global user.name "Brian Kerr"
$ git config user.email "my@emailaddress.com"
$ git config user.name "Brian Kerr"
To determine what branch the local repository is on, add a new branch, or delete a branch. Deleted branch new_feature (was 0254c3d). To start working in a different branch, use git checkout to switch branches. Integrate branches together. git merge combines the changes from one branch to another branch. For example, merge the changes made in a staging branch into the stable branch. To connect a local repository with a remote repository. A remote repository can have a name set to avoid having to remember the URL of the repository. Note: A remote repository can have any name. It’s common practice to name the remote repository ‘origin’. To create a local working copy of an existing remote repository, use git clone to copy and download the repository to a computer. Cloning is the equivalent of git init when working with a remote repository. Git will create a directory locally with all files and repository history. Receiving objects: 100% (5/5), 3.08 KiB | 0 bytes/s, done. To get the latest version of a repository run git pull. This pulls the changes from the remote repository to the local computer. Sends local commits to the remote repository. git push requires two parameters: the remote repository and the branch that the push is for. Writing objects: 100% (5/5), 734 bytes | 0 bytes/s, done. Writing objects: 100% (4/4), 373 bytes | 0 bytes/s, done. To save changes made when they’re not in a state to commit them to a repository. This will store the work and give a clean working directory. For instance, when working on a new feature that’s not complete, but an urgent bug needs attention. and have 1 and 1 different commit each, respectively. To show the chronological commit history for a repository. This helps give context and history for a repository. git log is available immediately on a recently cloned repository to see history. $ git log --<author>="Author Name"
$ git log --before="Oct 20"
$ git log --author="Brian Kerr"
Remove files or directories from the working index (staging area). With git rm, there are two options to keep in mind: force and cached. Running the command with force deletes the file. The cached command removes the file from the working index. When removing an entire directory, a recursive command is necessary. Brian Kerr is part of the Customer Success team at Wildbit from Iowa City, IA. Signup and get started in minutes. © Wildbit, LLC, 2007-2019. All rights reserved. The Beanstalk logo and name are trademarks of Wildbit, LLC.